SCVHistory.com LW3402 | Newhall | Charlie Chaplin at First Presbyterian Church in 'The Pilgrim' (1923). 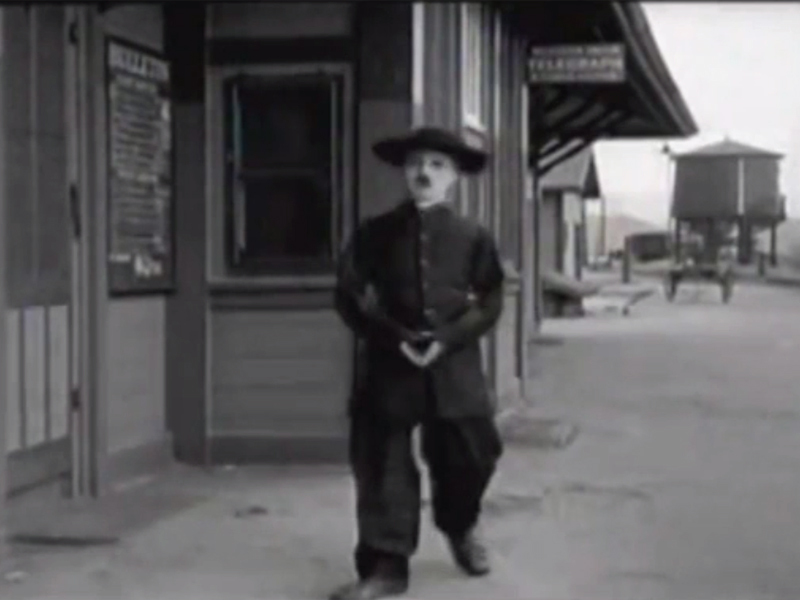 Sequentially in the movie, Chaplin uses both interiors and exteriors of the Saugus Train Station (which was in Saugus, now in Newhall). A bit later there is a church scene. Interiors were filmed on a sound stage, not in our local church. A quick cutaway of Chaplin leaning out the church window also was not at our local church. But then Chaplin and cast members leave the church. That's when the local church building is used. "The Pilgrim" gives us the tightest closeups of the original church building that are known. "The Pilgrim," which premiered February 25, 1923, in New York City, must have been one of the last motion picutures to use the original church building as a location. That same year, the wooden structure was replaced by a much more substantial brick building. The replacement was ruined in the 1971 Sylmar-San Fernando Earthquake. LW3402: Download individual screenshots here.